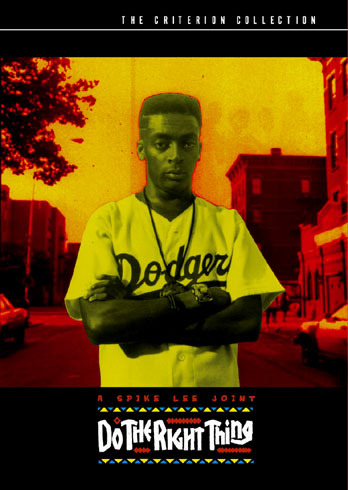 The last time I saw Do the Right Thing, I was in Brooklyn for a sleep-over. W___, my best friend, had invited me to meet Y___, who lived within throwing distance of Sunset Park. Y___ was Nigerian; his wife K___ was South Asian; and, as the other guests arrived, the party resembled, more and more, a U.N. General Assembly Meeting. I was the only delegate who had not brought his own pillow. The gathering wound late into the night, and those of us spending the night staked out floor positions. But even at 2 a.m., no one was tired. We debated books and art and politics, and nibbled on leftover chaat. We were, all of us, overeducated, despite (in spite of?) our various international upbringings, and K___’s naan tasted just as good cold as it did warm. Y___ had set up a projector to beam pictures from his laptop onto his wall. Someone stopped the slideshow and pulled up Do the Right Thing on YouTube. We watched, pausing every ten minutes or so as the invisible hand guiding the cursor searched for the next section. During those interstices, I thought about how far this slice of Brooklyn was from that one: 20 years and two bus transfers away. I was in Y___’s brownstone again two years later. W___ had moved into the apartment below Y___, and she was throwing a house-warming party. Many of the invitees I had met two years before. I brought W___ a glazed Portuguese tile with a portrait of Fernando Pessoa. She had already settled in quite comfortably: a vertical bookshelf made it look as if books were climbing up her wall. She had filled her disused dining room fireplace with books. An arch of books, a parabola of paper. Our lives are fire hazards. The party moved into Sunset Park. It was a pleasant fall late-afternoon, and the blanket kept the cold from seeping into us. The park was a patchwork of picnics. As we gathered around the homemade red velvet cake, a Hispanic toddler waddled up to us. His nose and mouth were a transparent slick of mucus. Someone offered him a slice, and he looked at it hesitantly and wandered off without taking it. Around us, lingual cacophony: the park of Babel. Then: sunset, something that would have been apocalyptic if it weren’t so beautiful. The air turned to blood. Loud Chinese music came over some loudspeakers as a group of dancers prepared their evening practice session. The red grew increasingly intense, as though someone were infusing oxygen into the blood. As other housewarmers returned to W___’s apartment, I watched the sky: redder, redder, redder.